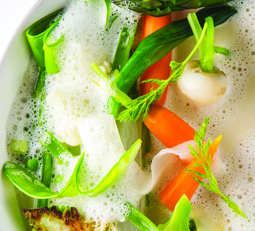 Choose the freshest in season vegetables to go with the nage stock! Place all ingredients (chopped and washed) in a pot, bring to a boil then slowly simmer for 45 minutes. Strain through fine strainer. Get a pan big enough to hold your vegetables and a large ladle or two of Nage stock. Add the stock and vegetables and keep on high heat until the bubbles in the pan start getting bigger. Add 1 to 2 spoons of butter and reduce. Serve, dress with sauce and top with a seared scallop or two! Garnish with micro herbs and salmon caviar.